Theatrical poster for the film. 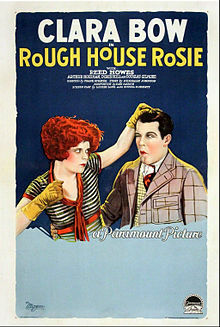 Rough House Rosie is a 1927 silent romantic-comedy film directed by Frank Strayer and produced/released by Paramount Pictures. The film stars Clara Bow, who was then Paramount's most popular actress. Reed Howes, a model turned actor, is Bow's leading man. The film is currently considered lost. What has survived includes a 54-second trailer and some clips shown in the BBC documentary Hollywood's Lost Love Goddess. It isn't clear whether or not the existence of these clips suggests the survival of the whole film or just fragments. The film's surviving 54 second trailer.